Max Reinhardt's varied selection of music features a special collaborative session involving Diabel Cissokho and Kadiale Kouyate on koras, and Finn Peters on saxophone and flute. 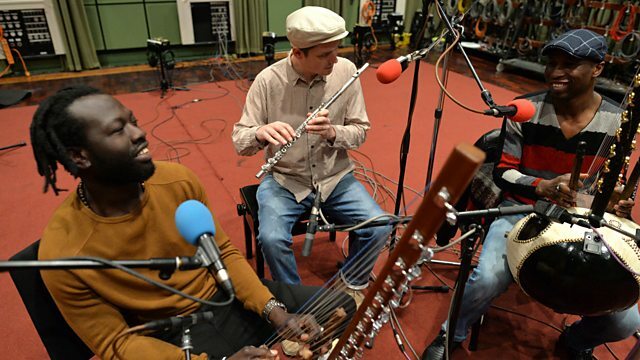 For this month's Collaboration Session we feature a trio who came together for the London Jazz Festival earlier this month, Diabel Cissokho and Kadiale Kouyate on koras, and Finn Peters on sax and flute. Plus a tune from Joseph Tawadros's oud-led jazz quartet, Rapoon's exploratory jazz musings, Yasmin Levy's take on a Piazzolla tango classic, harpist Ruth Wall's timely reworking of a seasonal classic, a new work by Charlotte Bray performed by Birmingham Contemporary Music Group and a track from US controversialist Elisa Ambrogio, who approaches her audiences thus: "If you don't like it, start your own band." Presented by Max Reinhardt. Performer: John Abercombie. Performer: Jack DeJohnette. Performer: Joseph Tawadros. Performer: John Patitucci. The Three Harps of Christmas. Performer: The Four Deuces. Composer: The Four Deuces. Composer: Ray Dobard. Music City Vocal Groups: Rock'n'Roll It, Mambo, Stroll It. Studio Neue Musik (WDR Radio, Germany). Performer: Yechiel Hasson. Lyricist: Fernando 'Pino' Solanas. Performer: Yasmin Levyft. Performer: Amijai Shalev. Performer: Alexandra Wood. Conductor: Oliver Knussen. Ensemble: Birmingham Contemporary Music Group. La Fauvette Passirenette: A Messiaen Premiere, With Birds, Landscapes & Homages. Performer: Kadialy Kouyate. Performer: Finn Peters. Performer: Diabel Cissokho. Late Junction Session: November 2014. Performer: Kadialy Kouyate. Performer: Finn Peters. Composer: Finn Peters. Performer: Diabel Cissokho.